What is known about Napoleon Bonaparte’s connection with chess? Despite frequent assertions that they are all spurious, three games allegedly played by him (i.e. against Bertrand, Mme de Rémusat and the Automaton) are regularly seen, not only in articles and books but also in databases (such as Essentia, which makes the improbable claim that the second of these was played in Paris in 1902). In contrast, on page 79 of A Short History of Chess (written in 1917 but not published until 1963) Murray wrote that Johann Allgaier ‘was the conductor of the Automaton when it played and defeated Napoleon’. “When Napoleon entered Berlin, in 1806, somebody thought of the neglected Turk, and Mr Maelzel, a clever mechanic, was ordered to in pest [sic – presumably inspect] and repair the dusty old enigma. From cobwebbed dreams of King Fritz and the brave Empress, the veteran chess player awakened to encounter a greater man, fresh from the field of recent victories. On this remarkable meeting we may dwell for a moment, since its history has been faithfully preserved by an eye witness and has never before met the public view. The emperor, on this occasion, signified his wish to do battle with the Turk, and accordingly Maelzel arranged a second table, near that of the Turk, proposing to repeat the moves on both tables. This was Maelzel’s usual mode of exhibition. Napoleon, characteristically overstepping the barrier which separated the Turk from the audience, struck his hand on the automaton’s chessboard and exclaimed, ‘I will not contend at a distance! We fight face to face.’ A grave nod indicated the Turk’s assent, and the game began. The emperor was disastrously vanquished. Shortly afterward a second exhibition was ordered. On this memorable occasion the emperor placed a large magnet on the automaton’s board. Maelzel smilingly moved the iron, so as not to embarrass the game. The Turk played on with his usual skill; the fatal échec (check) was heard again and again, and a second time Napoleon was defeated. In the mid-1920s a detailed article about Napoleon and chess, largely based on material from Le Palamède, was published on pages 129-136 of the fifth issue of François Le Lionnais’ magazine Les Cahiers de l’Echiquier Français. Below is a summary. 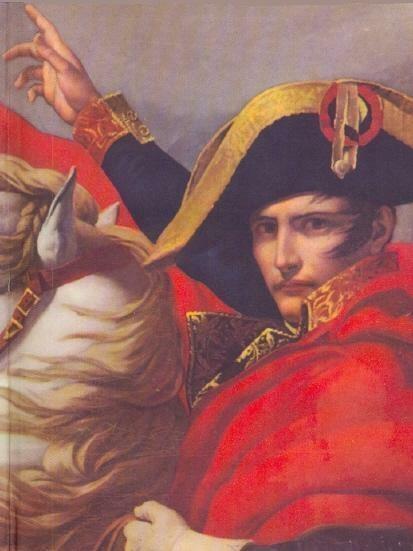 Throughout his life Napoleon had a deep love for chess, but was not a player of the first rank. He did not have time to study the game in depth; he opened poorly; he gave many signs of impatience if his opponent took too long over a move. However, he would sometimes liven up and play fine moves. 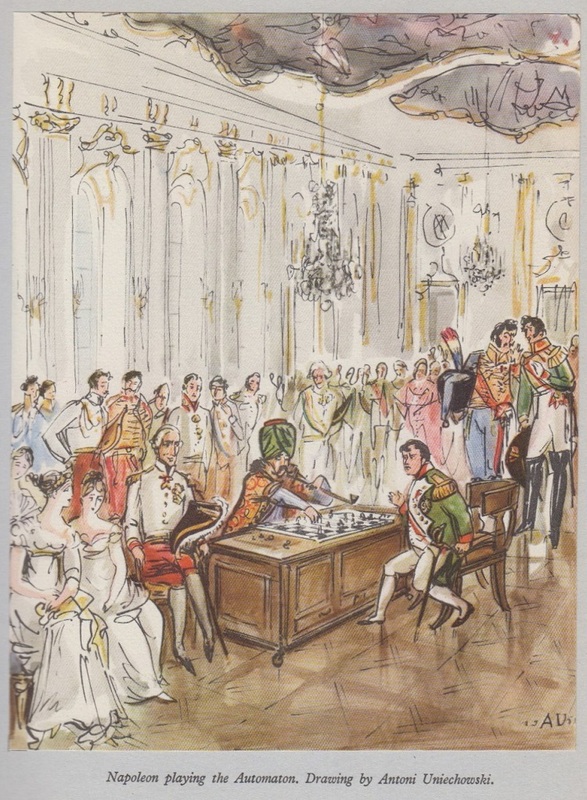 According to Labourdonnais, when Napoleon was preparing for his Polish campaign he was playing chess one evening with Marshal Berthier in the Tuileries Palace when it was announced that the Persian ambassador desired an audience. Since Napoleon continued to play chess, the ambassador gained his (partial) attention by claiming that the Persian cavalry was the best in the world. Responding to this, Napoleon, still engaged in his chess game, wrote out orders for his own cavalry (40,000 men) to go on parade at the Tuileries the following morning. The colourful George Walker (Frazer’s Magazine, December 1840) is given as the source for this story. In Egypt Napoleon played with M. Poussielgue, and M. Amédée Jaubert. During the Polish campaign, his opponents were Murat, Bourrienne, Berthier and the Duke of Bassano. 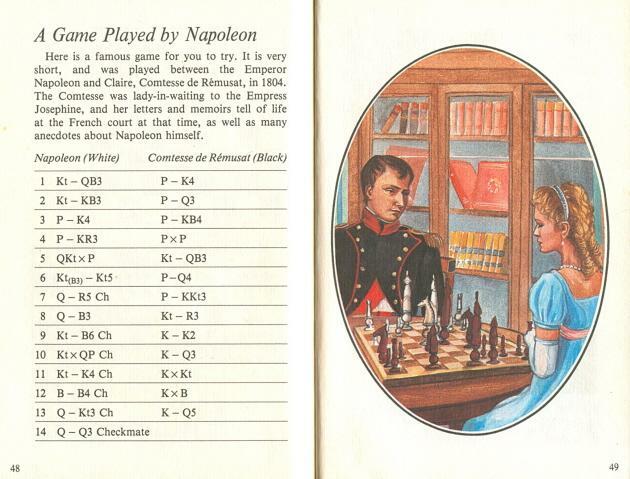 The last-named often played with Napoleon and he wrote: ‘The emperor was not skilful in opening a game of chess. From the outset he often lost pieces and pawns, but his opponents did not dare take advantage thereof. It was only in the middle-game that he was inspired; the mêlée of pieces kindled his intelligence; he saw more than three or four moves and implemented beautiful and clever combinations’. At St Helena he played every day. ‘If the game of chess had not already attained high nobility, it would be ennobled by giving a few moments of happy diversion to the greatest of prisoners and exiles’ (Le Palamède, 1836, pages 12-13). ‘The First Consul had arrived in search of rest and isolation at his retreat at Malmaison. Those in attendance that evening were his secretary, Josephine, a few ladies and a few officers. This gave the lady hope that the Duke might be saved. Le Palamède (July 1845, pages 328-340) reported that it was Mme de Rémusat who played against Napoleon that evening. The following morning the Duc d’Enghien was shot. Josephine wept on learning the news, and Mme de Rémusat did not think of asking Napoleon for a return game. ‘There is ample evidence that the chessmen from Mr Elphinstone did arrive at Longwood; also, if the Fitzsnob Papers are fictitious (most probable) there are other indications of Napoleon’s chess ability. With regard to the present of the Chinese chess set from Mr Elphinstone, Napoleon did receive them, according to the following authorities: Gourgaud, Baron: St Helena Journal… 1815-18 (London, 1932); Young, Norwood: Napoleon in Exile, 1815-21 (2 v., London, 1915); Balmani, Count: Napoleon in Captivity: the Reports of Count Balmani, Russian Commissioner … 1816-20 (London, 1928); also Forsyth, W.: History of the Captivity of Napoleon at St Helena from the Letters and Journals of the late Lieut.-Gen. Sir Hudson Lowe (3 v., London, 1853). Hudson Lowe did send them, but wrote a few days later saying that under his instructions he should have withheld them. This owing to the Imperial Crown and the N. England never recognized (before or after Waterloo) Napoleon the Emperor, but only General Bonaparte. “Count Bertrand to Sir H. Lowe. Lowe actually referred the matter to the British Government, and was ordered by Lord Bathurst (Foreign Secretary) to retain anything sent to General Bonaparte signifying any Imperial rank!!! The BCM then published a letter from F.J.O. Coddington of Bradford, who stated that he possessed an ivory chess set on which his great-grandfather, Major General Anthony Emmett, R.E., had played three games against Napoleon at St Helena. Considerable detail (of the oral-family-tradition type) was provided, but we have already seen that this domain is heavily reliant on the ‘it is said’ type of historical narration. ‘Napoléon, amateur d’échecs’, in Le Palamède, 1836, pages 12-13. ‘Un jeu d’échecs chinois’, in Le Palamède, 1839, pages 14-22. ‘Napoleon Playing Chess at St Helena’ (poem), in The Chess Player’s Chronicle, 1843, pages 175-176. ‘Une partie d’échecs gagnée par Napoléon’, in Le Palamède, July 1845, pages 328-340. ‘Napoleon’s Retreat from Moscow’ in The Chess Player’s Magazine, 1847, pages 47-48. Three alleged Napoleon games, in American Chess Journal, November 1878, page 198. Report that the son of W.H. Vanderbilt had been presented with a set of chessmen used by Napoleon, in the Brooklyn Chess Chronicle, 15 March 1884, page 84. ‘The Napoleons as Chess Players’, in the Columbia Chess Chronicle, 1 December 1888, page 188. ‘Napoleon I. als Schachspieler’ by L. Bachmann, in Schweizerische Schachzeitung, January 1903, pages 62-64, from Augsburger Schachblatt. Additional comments on pages 84-85 of Schweizerische Schachzeitung, March 1903. See too pages 148-151 of volume one of Aus Vergangenen Zeiten by L. Bachmann (Berlin, 1920). ‘Napoléon 1er Danseur’, in Revue d’Echecs, April 1904, pages 212-213. ‘The Defeat of Emperor Napoleon in a Historic Chess Match’ by D.A. Mitchell, in the Public Ledger (Philadelphia), 4 July 1915. ‘Napoleon’s Unique Ivory Chessmen’, in the American Chess Bulletin, November 1920, pages 174-176. 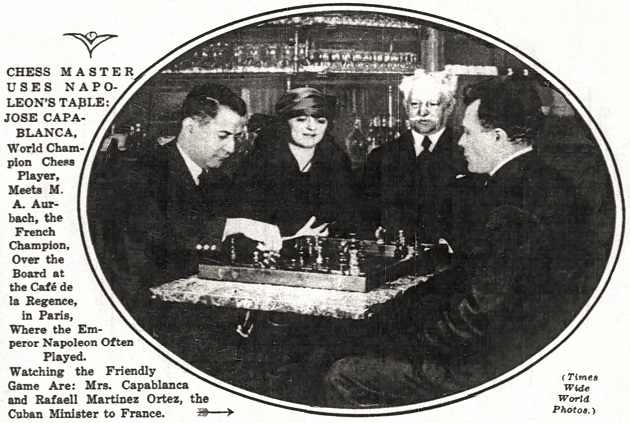 ‘Caissa’s Trysting Place in Paris’, in the American Chess Bulletin, July-August 1925, page 122. ‘Napoléon, joueur d’échecs’ (excerpt from Bourrienne’s Mémoires), in Les Cahiers de l’Echiquier Français, issue 11 (1927). 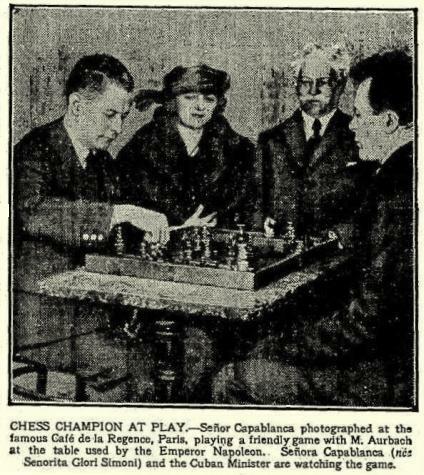 ‘Napoleon I as Chess Player’, in The Gambit, May 1927, pages 89-103. ‘Napoleon als Schachspieler’, in Kagans Neueste Schachnachrichten, January 1929, pages 20-21. Comments by D.J. Morgan (‘… Napoleon’s win – no less than his vaunted skill at the game – should by now be relegated to the realms of chess romanticism’), in BCM, October 1953, page 276 and February 1954, page 55. ‘Napoleon als Schachspieler’ by J. Krejcik, in Schach-Echo, 20 October 1954, pages 316-317. ‘Napoléon et les jeux d’échecs de l’Honorable W.F. Elphinstone’, in Le Vieux papier, October 1969, pages 381-390. Chess: Man vs Machine by Bradley Ewart (London, 1980). See also the section ‘“Napoleon Tarrasch” – ein Militarist?’ on pages 575-583 of Siegbert Tarrasch Leben und Werk by Wolfgang Kamm (Unterhaching, 2004). Source: Wiener Schachzeitung, February 1924, pages 34-35. In the original edition, Z szachami przez wieki i kraje (Warsaw, 1960), the picture is opposite page 116. A cartoon based on the picture of Napoleon at the start of the present article can be found in Η ζωή μας είναι σκάκι by Κώστα Νιάρχου/Costas Niarchos (Athens, 1972).